Bones is the new and elegant collection of flowerpots designed by the Italian architects Roberto Palomba and Ludovica Serafini for VONDOM. Bones is elegant by its slimness but at the same time strong by its conception. Its generous volume is alleviated for a subtle edge that makes it light. Bones is reversible, it is to say can be planted with the wide part or to use that part as base whenever the greater stability to be needed or by esthetics. By the level of engineering Bones is fantastic, an invisible internal structure provides the necessary strength transmitting the weight from the base of the container to the base of the flowerpot for achieve to support the weight of any plant or tree. 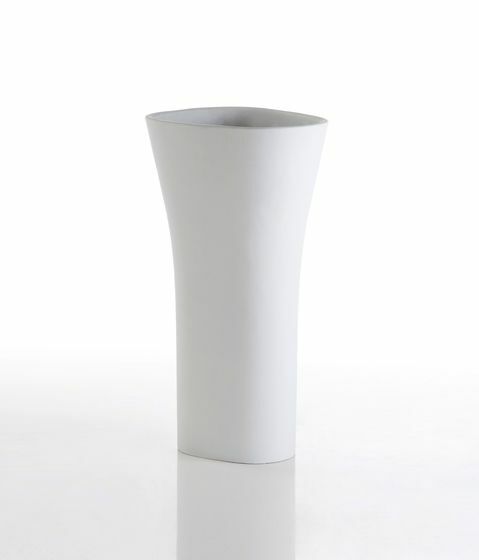 Bones is manufactured in resin of PE by means of the rotational molding technique and is available with multiples finished made in VONDOM. Ludovica+Roberto Palomba´s work has always been rich of cultural references. Their projects are derived from observations of change in human behavior. Their mission is to generate products that merge function, innovation and longevity – intimate and emotional connections that last. “We believe that good design already exist in a sort of collective unconsciousness and our task is to mold and deliver them”. A truly successful piece of design must feel fresh but not unfamiliar when it is discovered.